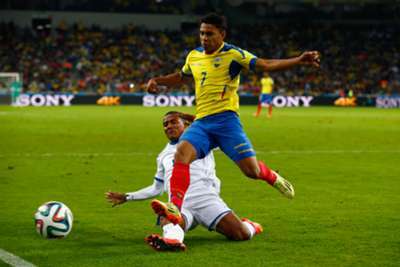 Swansea City have completed the signing of Ecuador winger Jefferson Montero from Mexican club Morelia for an undisclosed fee. The pacy 24-year-old has been linked with several clubs, but Swansea have lured him to the Liberty Stadium on a four-year deal. Montero’s arrival comes just a day after midfielder Gyfli Sigurdsson returned to the Liberty Stadium from Tottenham, with left-back Ben Davies and goalkeeper Michael Vorm moving in the other direction. Montero, who has 43 caps for the South American nation, had stated his intention to move to Europe after the World Cup. West Ham and Arsenal were among the clubs said to be keen to bring him to the Premier League, but he will now ply his trade with Garry Monk’s men. Montero, who can play on either wing, had a spell with Villarreal earlier in his career, but was unable to make an impact and was loaned out to Spanish rivals Levante and Real Betis. Bafetimbi Gomis, Marvin Emnes and Stephen Kingsley are the other new arrivals at the Welsh club ahead of Monk’s first full season in charge.